McNary didn’t accomplish everything it wanted at the Greater Valley Conference Championships this season but the future continues to look bright for the cross country program. McNary senior Kailey Doutt and freshman Ella Repp both ran their best times of the season on Wednesday, Oct. 25 at Bush’s Pasture Park but missed out of the top 10 and advancing to the state meet by finishing 12th and 13th in 19:39 and 19:46. Doutt said she felt good for the first mile but her legs just wouldn’t allow her to keep up with the lead pack. North Salem senior Madison Willhoft placed 10th in 19:18. Repp, who was able to break 20 minutes for the first time, battled a side ache for the first mile. Sprague junior Ginger Murnieks led from start to finish to easily win the varsity girls race in 18:04. South Salem junior Anna Chau took second in 18:23. 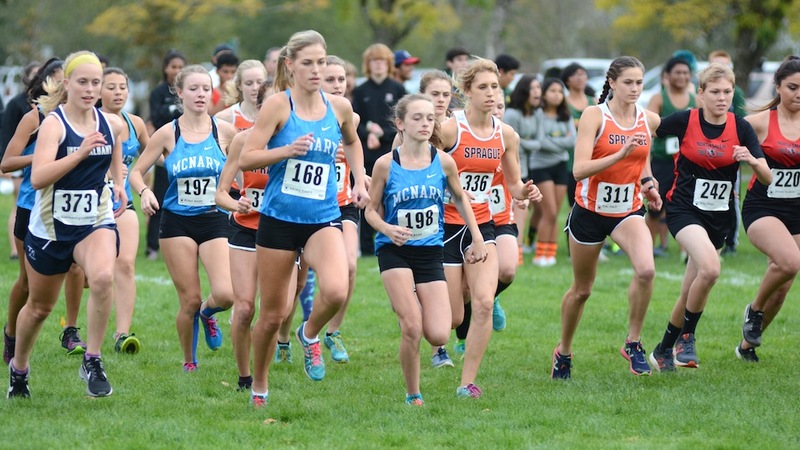 Sprague put two more runners in the top five, Kaylee Mitchell and Elise Abbott, to edge Forest Grove for the team title. The Lady Celts placed seventh. Another McNary freshman, Nina Garland, beat her season best by nearly 40 seconds, finishing in 21:31. Sophomore Duyen Barr, who also had a PR of 23:14 and Alison Repp (23:56) completed the scoring. The varsity boys race was much closer with Forest Grove sophomore Quincy Norman edging out McMinnville junior Zane Fodge by two seconds for first place. McNary junior David Allen finished 21st in 17:40. Senior Jonas Honeyman (18:25) and freshman Tristan Proctor (18:29) both PR’d for the Celtics, who finished sixth as a team behind McMinnville, South Salem, Forest Grove, West Salem and North Salem. Freshman Ethan Whalen (18:39) and junior Francisco Orta (18:57) also scored for McNary as all seven varsity runners finished under 19 minutes for the first time this season. Running in the junior varsity race, freshman Nathaniel Prout was also able to cross the finish line in under 19 minutes with a PR of 18:49, which gave Holcomb yet another reason to feel optimistic about next season.